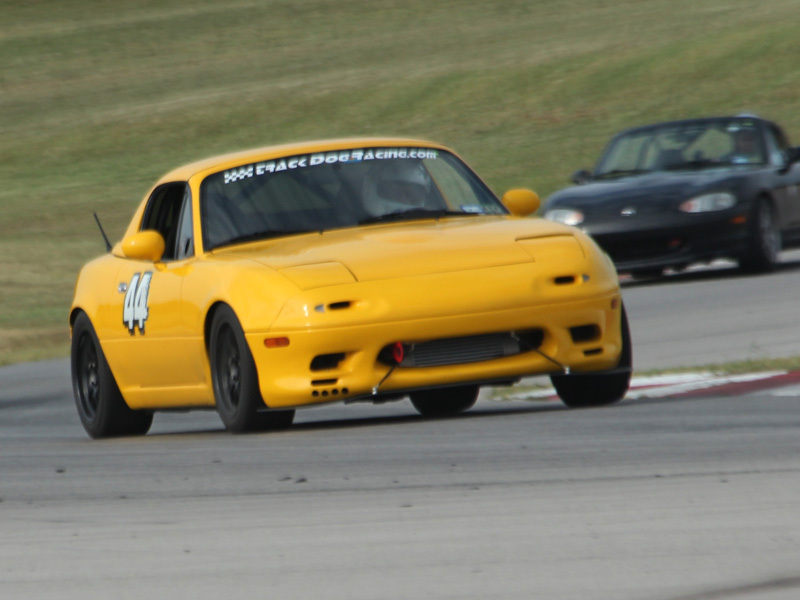 First and foremost, the people at Track Dog Racing™ are Miata enthusiasts. Everyone of us owns at least one Miata, Most own two and a few own three or more! Combined we have well over 30 years working with Miatas! We love what we do and think it shows in the service to you, our customer. Now let's meet the crew! Gary Shuhart, the head dog, has a degree in industrial engineering from Texas A&M University. By the time he joined the Miata community, Gary already had more than 30 years of expertise in the field of industrial heating and process control systems. Gary developed some unique products for his own car, a 99 Miata with a BRP MP62 and was encouraged to put them into production. In the Spring of 2003 he started another company, Track Dog Racing, and has been successful selling his performance products on the internet and through distributors. One of the first products to market was the TDR air splitter. After having several encounters with curbs and other obstructions, Gary designed and built the first prototype TDR air splitter. After finally getting the design worked out for his 99 Miata, he then started designing them for several other Miatas. The air splitter quickly became a popular product. Along with the air splitters, Gary designed and developed the TDR Heat Shield. Nearly 5,000 heat shields are in use and they have excellent reviews from our customers. Finally, in the Spring of 2003, Gary designed and developed the first production Air-to-Air intercooler for the MP62 supercharger. This intercooler has proven so successful that it has been developed for the Greddy, BRP and FM Turbos, Jackson Racing M45 Supercharger, MOSS and BRP MP62 Supercharder and now the TDR Rotrex Supercharger, helping these induction systems produce incredible and safe horsepower. Gary is continually developing new and unique products. Check out the "New Products" section for future product releases. Gary is a long time car guy. He has a strange obsession with yellow cars and currently owns three yellow Miatas, a yellow Datsun 240Z and a yellow Lotus Evora. He is also a huge racing fan and can talk for hours about F1, Vintage Racing, MotoGP or just about any other racing on a circuit. William Curran, has an art degree from Collin College and has done everything from selling new Mazdas to working IT support for law firms but finally found his calling in making his hobby his job. He has been tinkering with Miatas since 1997 when he got his first one, a 1995 M-Edition. A car guy since birth, his first project was rebuilding a European 1974 Ford Capri in his parents' driveway. Since then he has had several Miatas and currently has a fully customized 1996 R-Package shown at right and a 2006 Copper Red MX-5 GT. He has vast experience working on cars and specifically Miatas longer than anyone here. He runs the show. William handles the shop scheduling, answers all the phone and emails that come in. He is also our web developer, office manager and handles just about anything else that needs to be done. While not a track junkie he does enjoy going when time and funds allow. When he isn't playing with, working on or answering questions about Miatas, he spends time with his wife and daughter at horse shows. His daughter is an English equestrian hunter jumper. 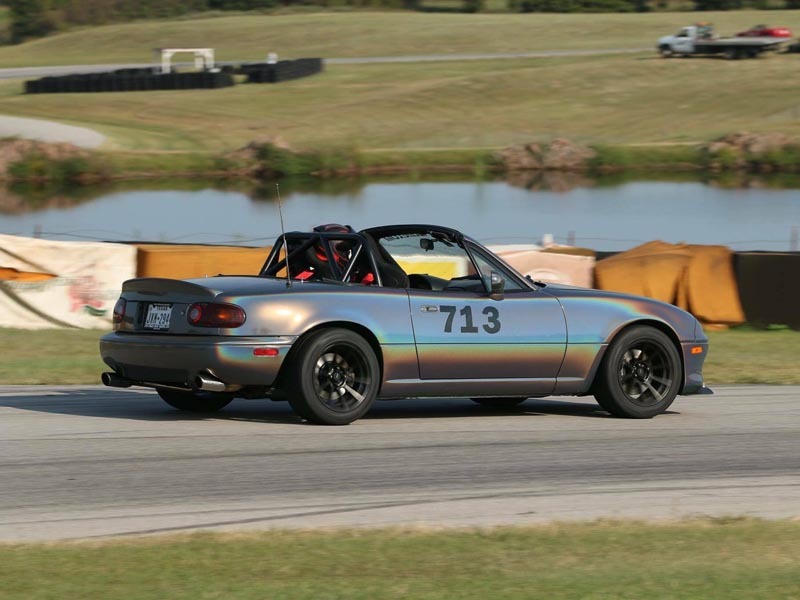 Josh Edwords is a Miata Enthusiast and track junkie and has a dedicated 1994 track Miata he has built himself. He helps out with multiple duties around the shop including shipping and receiving, inventory, putting together kits for our products and anything else that needs to be done. We will even turn wrenches when needed. His positive attitude and work ethic make sure the shop and internet sales run smoothly. Josh's daily driver is a Mustang GT but so far he hasn't killed any spectators. He is married, races cars, wrenches on them when needed and likes to shoot guns like every good Texan! David is our newest members of the Track Dog Racing team. 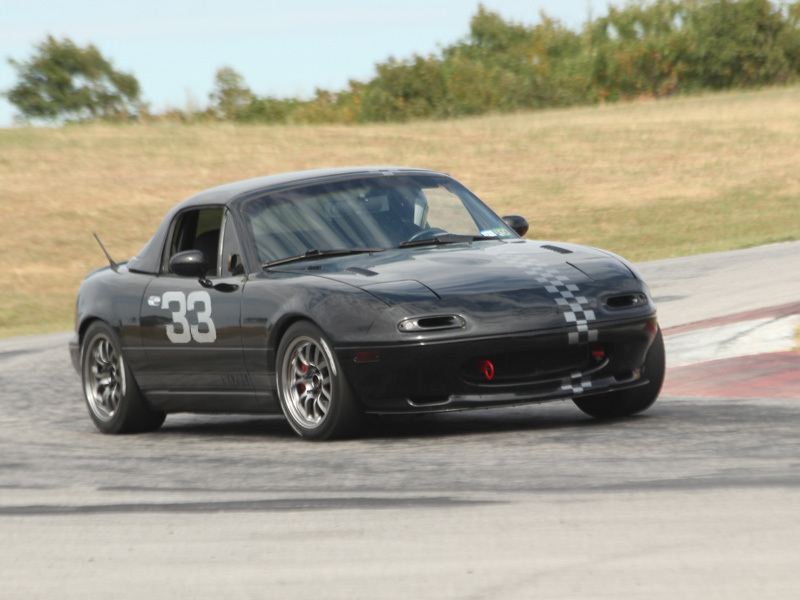 He actually started out as a good TDR customer and had us build up his wife's 97 Miata with suspension, roll bar, interior upgrades and a full Rotrex supercharger shown at the right at Hallett Motor Racing Circuit. He also has a 99 Sport Package Miata that is next to be upgraded. David has always been a car guy and also owns a Ford Focus RS. He started out studying mechanical engineering and has a degree in business economics. David is one of our mechanics and he is quickly getting up to speed on all things Miata. He is now following his dream of working on cars. David is married and has three dogs. David and his wife are originally from South Dakota. He is also probably the best driver in snow in the state of Texas!